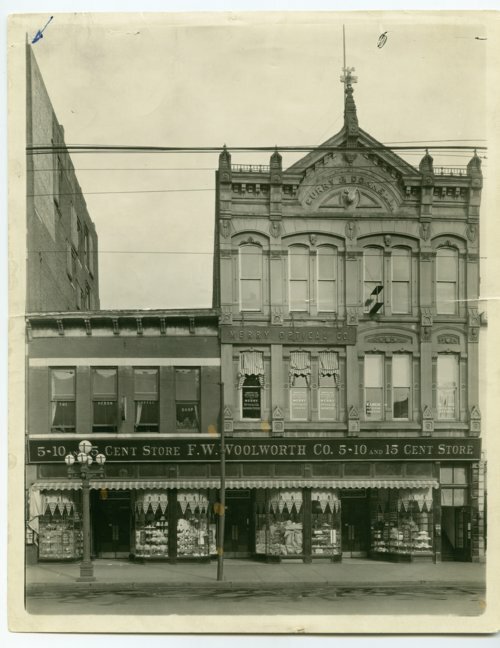 This is a photograph showing the F. W. Woolworth Company 5-10 and 15 cent store located at 627 Kansas Avenue in Topeka, Kansas. Other businesses visible are The Heron Coffee Shop, American Optical Company, Merry Optical Company, and W. A. Wehe physician and surgeon's office. Part of the Woolworth's store and some of the businesses are in the Curry & Donnell building.